This issue of St Mark’s Review explores theology and religious life in Sydney over the past century. Articles range across the denominational spectrum and also consider the place of theology in Sydney’s cultural and intellectual life. The year 2016 marked the centenary of the Heretics Club, a dining club based at the University of Sydney devoted to theological and religious discussion. In November 2016 a one day symposium was held at St Paul’s College in the university. 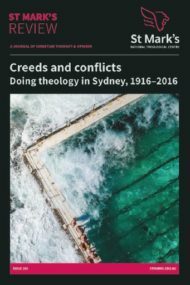 The title chosen was “Creeds and Conflicts: Doing Theology in Sydney, 1916–2016.” Speakers were invited to present papers on theology and religious life in Sydney over the past century and to respond to the suggestion in the title that there is a conflictual aspect to the Sydney scene that has influenced theological development. These papers are presented in this edition of St Mark’s Review.